I love pink flowers and I love to paint pink colour. But how to paint the colour pink? Let me show this on one of my pink watercolour paintings. But before let me analyse the colour pink for artists and non-artists. When a non-artist sees a pink flower then this person sees only pink. The non-artist usually isn’t aware about the different colours involved in creating warm and cool pinks, light and dark pinks. What this person realizes is only pink. But for us artists the pure pink is only the local colour. What is local colour? Local colour is the natural colour of an object, here of our flower. It is that colour which is untouched by light or shadow. But we artists have to be aware of this differences, we have to paint the light and shadows. How to do that? How to paint pink? Let me show how to paint pink with the help of my Pink Hydrangea Watercolor Painting. In the hydrangea itself I used for the pinks Permanent Rose from W&N. 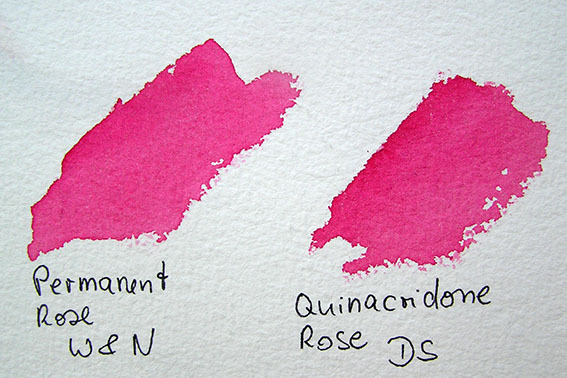 Of course the Quinacridone Rose from DS is fine, too. I have both pinks available and as you can see there is no difference. There is also no difference when painting as both pink colours are transparent. Another alternative is Ruby Red from Schmincke. It is the same colour and also transparent. In my Hydrangea Painting the Permanent Rose was my local pink colour. For the cool areas where the tiny petals are affected by light and sky I mixed this pink colour with some cobalt blue. At the base of the petals (where they meet other petals) I started with a yellow underwash, because I wanted to have this area warm. I then mixed my pink with some red. I am using Anthraquinoid Red from DS. So the mix of my Pink and the Red works perfect to create a warm area. My highlights are the white of the paper and other light areas got only a tiny touch of cobalt blue. Not all of our light areas are the same light and not all areas are highlights. This all helps you to create the form. Always remember to create harmony in your painting. Your pinks will need some green, too, if you surround your flower with green leaves. It is the same with the leaves, because they then need also some of your pinks. The colour of the leaves reflect on the flower and the colours of the flower reflect on the leaves. In the photo it is easily to see how working with cool and warm pinks help to create the realistic three dimensional form of my flower painting. Be always aware about the colour temperate (cool against warm colours) and also light against dark as this is the key to create stunning realistic watercolor paintings. When painting flowers and roses you also need to be aware about the local colour and then you need to create the warm and cool areas with adding cooler or warmer colours to your local colour. Find out more about how to paint flowers on my Free Watercolor Lessons Page or on my DVDs.